Creamy Spanish croquettes are one of my favorite tapas and this modernist version is no exception! A delicious crunchy shell with creamy custard-like egg yolk filling paired perfectly with warm nutty Gruyere foam. 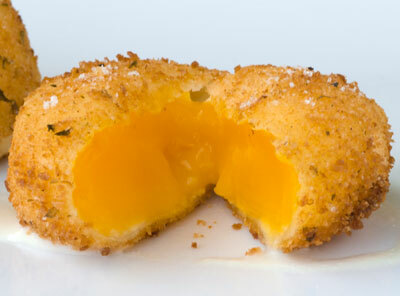 The egg yolk is cooked sous vide at its ideal temperature of 64.5 °C (148 °F) to obtain the tender gel consistency that makes this croquette so luscious. The temperature at which we cook an egg affects the resulting texture of the egg white and yolk. When cooking an egg in boiling water, the desired temperature at the center of the egg is reached by the length of time we leave the egg in the water. But a mere 30 seconds in cooking time can change a soft-boiled egg into a hard-boiled egg. To make things more difficult, the required length of time varies with the size of the egg and inevitably, the temperature inside the egg will not be consistent (being hotter closer to the outer shell). This is why Sous Vide is a perfect method for cooking an egg at its ideal temperature. The temperature is easy to control and it guarantees that it is the same at every point inside the egg. The perfect egg yolk has a custard-like texture when cooked at 64.5 °C (148 °F), the temperature at which the protein livetin denatures and causes the egg yolk to form a tender gel (Sous Vide for the Home Cook by Douglas Baldwin). At this temperature the egg white is barely set and undercooked so I prefer to cook just the egg yolks and use the egg whites for something else (like in this case) or cook them separately. 1- Cook the egg yolks for 45 min in a sous vide water bath at 64.5 °C (148 °F). If you have a Sous Vide Supreme, you can just place the egg yolks in the water bath and flip them after 25 min. If you are using a sous vide immersion circulator you may want to place the egg yolks in a pouch and tie them to the edge of the bath container to avoid getting them tangled in the circulator pump. Alternatively, you can cook the eggs in their shells and separate the yolks after cooking them sous vide. I prefer the first method so I can use the egg whites for another preparation. 2- Carefully place the cooked egg yolks in a bowl filled with water at room temperature. 3- Whisk one raw egg in a small bowl and add a pinch of salt. 4- Place the flour in a small bowl and the seasoned bread crumbs in another one. 5- Using your hands, carefully dust the egg yolks cooked sous vide in flour, dip into the whisked egg and coat it with seasoned bread crumbs. 6- Heat the light olive oil in a small frying pan until it reaches 190 °C (375 °F). 7- Add one croquette at a time making sure it is completely covered in oil. 8- Fry until golden color and transfer to tray lined with paper towel. 9- Check that the oil temperature is at 190 °C (375 °F) before adding the other croquettes. 1- Heat the chicken stock in a small pot or microwave. 2- In a hand mixer cup blend hot stock with grated Gruyere cheese. 3- Add the Iota Carrageenan and Xanthan Gum and let them hydrate for a minute. 4- Blend thoroughly with immersion blender. 5- Season with salt and lemon juice and blend one more time. Keep in mind that the mix will expand about 3 or 4 times as you expel it from the ISI Whip so you’ll have to add 3 or 4 times more seasoning than you would normally do. 6- Using the ISI funnel and sieve, pour the mixture into an ISI Whip or Culinary Whipper with straight nozzle, screw 1 cream charger (2 if using 1L ISI Whip) and shake 5 times. 7- Place the ISI Whip or Culinary Whipper in a double boiler with water at a temperature of 50 °C (120 °F). Keep it warm until serving time. If you made the preparation well in advance, you can store it in the fridge until you want to warm it in the double boiler. 1- Pump some warm Gruyere foam 2/3 from one side of the plate. 2- With the back of a spoon, spread the foam across the plate in one stoke. 3- Place one sous vide egg yolk croquette on the plate. 4- Season croquette with white truffle salt. 5- Garnish with a few micro green leaves.